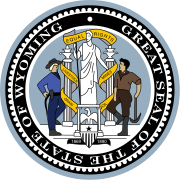 The 2018 United States Senate election in Wyoming took place on November 6, 2018 to elect a member of the United States Senate to represent the State of Wyoming. The primary election took place August 21, 2018. Although Republican John Barrasso won reelection with a super-majority of 67% percent, this was still the smallest voting margin of his U.S. Senate career and the closest a Democrat got to winning a seat since the 1996 election. In 2012, incumbent John Barrasso (R) was re-elected with 76% of the vote. Due in large part to Wyoming’s low population and rural setting, it is considered the most Republican state in the nation. It has not voted for a Democratic senate candidate since 1970. In 2008, John McCain won the state with 64%. Mitt Romney won it in 2012 with 68% of the vote, and Donald Trump won it in 2016 with 67% of the vote. ^ "Barrasso says he's ready to take on possible primary challenges". wyomingnews.com. 2017-10-11. Retrieved 2018-04-04. ^ a b c d e "2018 Primary Election Candidate Roster" (PDF). Wyoming Secretary of State. Retrieved June 1, 2018. ^ "Former Presidential Candidate Files In Wyoming U.S. Senate Race". KGAB AM 650. Retrieved 26 August 2018. ^ Costa, Robert (October 9, 2017). "GOP megadonor Foster Friess exploring a run for U.S. Senate in Wyoming". The Washington Post. Retrieved October 9, 2017. ^ "GOP megadonor Friess to run for Wyoming governor". Politico. April 20, 2018. Retrieved April 20, 2018. ^ Peters, Jeremy W.; Haberman, Maggie; Thrush, Glenn (October 8, 2017). "Erik Prince, Blackwater Founder, Weighs Primary Challenge to Wyoming Republican". The New York Times. Retrieved October 9, 2017. ^ "Democrat Gary Trauner Announces Bid for Wyoming U.S. Senate". U.S. News & World Report. December 8, 2017. Retrieved December 8, 2017. ^ "Wealthy independent enters Wyoming US Senate race". usnews.com. Retrieved 26 August 2018. ^ Arno Rosenfeld. "Trump is backing Barrasso ahead of a reelection campaign. Will that matter?". trib.com. Retrieved 26 August 2018. ^ "End Citizens United Endorses Gary Trauner for U.S. Senate in Wyoming". End Citizens United. March 1, 2018. Retrieved March 14, 2018.